Denis Onyango(right) works with goalkeeping coach Sadic Wassa (left) at Namboole on Tuesday evening. Both at Mandela National Stadium, Namboole. Uganda Cranes Vs Sao Tome and Principe. 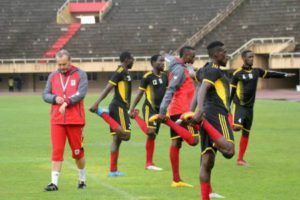 The Uganda Football National team, the Cranes have today (Tuesday) started their training ahead of the upcoming international friendlies. The Cranes are slated to take on Sao Tome this Saturday before taking on Malawi the following Tuesday. The training started in the evening after the down pour and 20 players, mostly professionals took part in the day’s drills which includes short sprints and stretching. Kizito Luwaga, Alex Kakuba and Godfrey Kizito where the only players who didn’t trian with all of them yet to jet into the country. 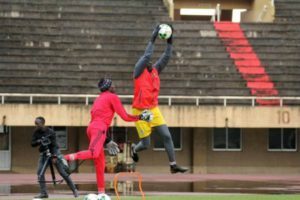 Sadic Wassa who is deputising for Fred Kajjoba (in USA for coaching course) took over the goalkeeping drills as he sharpened keepers Robert Odongkara, Salim Jamal and captain Denis Onyango. 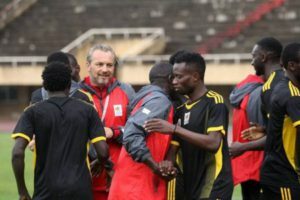 Head coach Sebastien Desabre hailed the commitment of the players and vowed to fine tune the team in preparation for the two games. “I am very happy for the commitment that the players have shown today, said Desabre after the training. “I hope i can get them to the level that i want them to be at in the few days we are going to work together. Hassan Wasswa Mawanda, while addressing journalists after the training expressed his overwhelming joy working under the new coach for the first time and he expects to learn a lot from him. “Training has been good as we have been in body conditioning for this first session, said the versatile player after the session. “The coach has briefed us on his philosophy and approach towards the game and i am already excited. “All of us are committed to working with him and hopefully everything turns out as planned. Team training resumes on Wednesday with a double session at Namboole. Some of the players that turned up for the first training session share a light moment before the session.